Wouldnt mind living behind these bars.. !! New bars would be great. Awesome I could really use these! 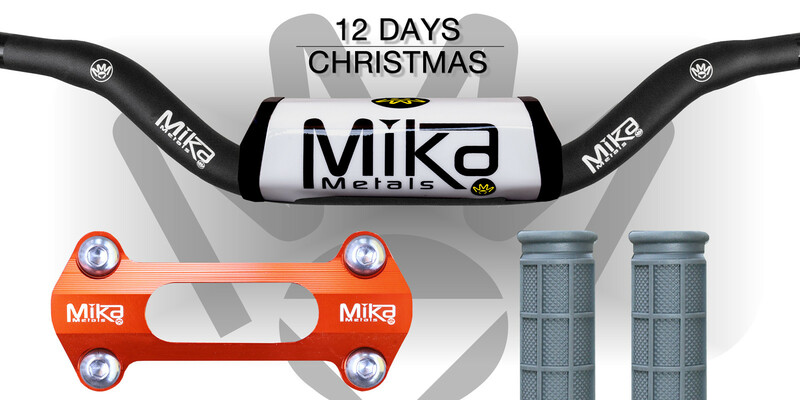 Stocking stuffer at it's best - Mika Metals products! I found my wife's present lol. This would be perfect for her bike though. Yes! i want some new bars! Really could use these on my buddys RMZ250, this would make an excellent gift. l do love me some Mika hard parts! bigger bars for me please, calling them fat might hurt their feelings. Always liked Mika Metals products! Those Mika bars look really good would really like to give them a try! Would look good on my bike! My bars are boring, these look much better! I would really like a new set of Mika fat bars!!! Would love to give these a try!! Winning this would Mika me very happy! Another great product for the 12 Days of MXmas!! Interested in the feel of these bars. I have heard good things. Mika Metals bars would look awesome on my bike. I’d love to see if the flex difference would help my arm pump. Need some new bars to try. Thank you Mika for another awesome product! Saved the best for last? I may as well throw my name into the hat. These would look great on my yz! Wouldn't be opposed to trying! I could use some new grips, but would gladly take bars and bar clamps to match. i would motorboat those puppies so hard. Best bang for your buck products by far. Lots of quality gifts this year!!! Love my mika bars.. could use a refresh tho! All of their products are great. Huge Fan of their chain and sprockets. Love the look of the Mika bars on the bikes I have seen them on, haven’t been able to locate a set here in Australia as yet (maybe winning them will be my chance ?) I think they would look sick on my bike! My KX would look dope with Mika Bars. Use these bars and love them, need them for my other bike. These bars will look great on my 150. A GUY named MIKe B could use a set of MIKa Bars from GUYB! (ya, im trying here folks). Way to close it out. This would be a sick addition to my exotic electric motocross bike! I need this not more socks. Been using your product for years! That won't ever change! Always impressed with mikametals products??? Big fan of Mika products. A good bar and grip set up are vital. It's been fun. Thanks for the opportunity to win fabulous wealth and moto parts. Thank you so much for the opportunity Vital! Merry Christmas to you all!! Thanks for all the killer giveaways! Good luck to everyone! I keep trying to win these things, can this giveaway be the one? ?